Hi! My name is Paige, and I like games – outdoor games, group games, family games, just fun games. Because, hey, who doesn’t enjoy having fun and laughing with family and friends? I grew up in a big family (the oldest of six kids), we had lots of cousins, and playing games was always a big part of my childhood and family reunions. I was also very involved in a youth group during high school, where we often played fun group games to get to know each other and have a good time. Over the years I’ve played dozens of games, and eventually I started keeping a list. That list on a Word doc on my computer eventually turned into this blog, where I thought that maybe I could share some of these games with others. Another reason I started this blog is to help families have more wholesome, quality family time, because I especially believe that quality family time is essential to having a happy family. Read more about ways to strengthen families. So if you’re planning a family reunion, throwing a party, entertaining bored kids, or just getting together with any group of people looking for some fun, I hope you can find the right game here. If you have ideas for new games, comments, or suggestions, I’d love to hear them! You can contact me here. As for just a little bit more about me (if you’re curious), I’m married to the best husband and dad in the world, who proofreads all my posts, is the webmaster and designer behind this site, and is my best friend and companion. We have three kids, and they keep us both busy and happy. My faith and religion are very important to my life. I studied English linguistics and editing in college and worked for a bit as a technical writer at an awesome educational children’s software company. Now I am a full-time mom. I’ve struggled with postpartum depression over the last few years, which has been at times very difficult. I’m grateful to friends, family, creative outlets like this blog, and mostly my husband for helping me through this tough trial. I often wish my life had more ice cream in it (can’t ever get enough ice cream), but I am very blessed and grateful for my life. So happy to have found your blog. You saved me with classroom parties this year. I’m excited to try some games at home with my family as well. Thank you for taking the time to share all of your great ideas! Thanks, Amanda! So happy to help! Greetings from Quebec, Canada! I’m really happy I came across your page- great ideas and a sense of family here. You should have a donations page! Keep up the great work!!! Wow, thanks, Eddy! This is the best comment I’ve read in a while! Thanks for the kind words. Hi Paige! I just wanted to let you know that I recently linked back to your word generator in my post 50 Fabulous Summer Bucket List Items (http://firstyoumustbegin.com/2015/05/50-fabulous-summer-bucket-list-items.html). If you would like me to remove the link, I’m more than happy to do so. I really appreciate all that you’ve done to provide fun and wholesome game options for all to enjoy! I think that’s great, Sara! Thank you! Thank you for the free word-lists! You saved me a lot of time! Having my son’s Birthday, this’ll be used for a Pictionary game for the parents! Happy to help, Meesum! Thank you! Game words: First love you game “Game Words”. I work at a drug detox and use the app to play game and relive stress. The patients always thank me for doing my group with your app. I noticed 2 weeks ago that when i tried using your app on my Iphone 6, when I try to change the difficulty level or the game i want to play it won’t let me. I think this started when one of the updates happened. I have tried to delete the game and reinstall it on my phone but nothing seems to fix this issue. I didn’t know if you were aware of this problem.I was wondering if you could look into this problem for me. Thank you for your great game and time with this. Oh, thank you so much for that feedback, Joseph. I really appreciate your catching that issue! My husband is the programmer and he’ll get right on it. Thank you for the nice comment, Michael! My sister is actually headed to China to teach English is a few weeks, too. Best of luck to you! Thank you so much, Bruce! That’s super nice of you to say. I hope your family had a great Thanksgiving! Paige, as an English teacher I’ve found this website absolutely marvellous! Thank you so much for all the material and ideas. I’ll even play some of these games at home with my family. I’m sharing the site with all my colleagues. Have a great New Year! Daniela, that’s one of the nicest comments I’ve ever received! Thank you so much! I hope you have a great New Year, too! I surprised a group of teenage robotics club members with your Science Lab Escape Room game this evening. Great job on the game. The kids really enjoyed it. Totally worth the $25. The clues were great, the graphics were great, the theme was great and you tied the whole game together nicely. Nice touch having the clues on the web sites. Very well written and thought out. Instructions were clear and easy to understand. I give you 5 stars! Wow, thanks, Chris! So kind of you to say! I’m glad your robotics club members had fun. That’s what I like to hear most! Thank you, N! That’s so nice of you to say! Your work using play and creativity sounds like my kind of job. I’m all about fun 🙂 Good luck! hi! 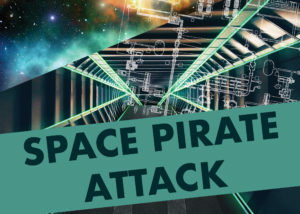 I found your website last night and was hoping to purchase one of the escape room packages for two birthday parties this month – one party is a group of 10 year olds and the other party is a group of 8 year olds. What do you recommend? 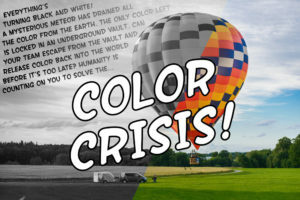 I recommend the Color Crisis escape room. I designed it for ages 8 to 12. It should be perfect for your age groups. Hi there, just wondering what escape room game you’d recommend for an 11 year old girls party. Would the science one be ok or too tricky? I think the science one should be fine for 11 year olds, especially if you use the easy version. Hi Grayce! I’ve never heard of that game before but I’ll look into it! Thanks for sharing!